When a special day or event approaches, more often than not, it revolves around food and drink; Valentines Day, birthdays, weddings, funerals, Easter, Christmas...etc.,etc. If we succumbed to every event, we would rarely eat healthily and always be chasing our goals. So we HAVE to sort out our psyche and our mindset before anything else. Otherwise we will be making excuses for ever. Rather than use the latest event or celebration as a reason to fall off the proverbial band-wagon, I believe that if we can turn our thinking around and the attitude of the people around us-friends, family and loved ones, we can have our cake and eat it! Literally or metaphorically! Those of us who are on a weight-loss journey or trying to maintain a healthy way of eating, are most likely to be people who adore food...love talking about it, looking at it and most of all- eating it! However, there is nothing to stop us taking care of our own nutritional needs -whether that is when we are preparing food ourselves, or asking others for support when they cook for us. If you were vegetarian, or allergic to certain foods, you would not hesitate to ask a friend or restaurant to cater for your needs. So why is "I am eating a low-fat diet" so difficult to say? ....adapting our tried and tested recipes because we KNOW the propoints or calories. ....making an every day event a little bit special. ...presenting low-fat but luxury foods in an extra-special way. ....when your loved one doesn't sabotage your efforts and makes your sacred treat look like a work of art. (This picture was sent to me by a dear friend, whose thoughtful husband makes her a beautiful mosaic out of mini smarties each evening in a special dish that used to belong to her mother). ...really thinking about the recipient of the food you make. ...building a crazy sculpture out of fruit because you want to impress someone! ...by the way, aren't blueberries exquisite when you cut them in half horizontally? ...loving yourself enough to find out what your heart truely desires, and making it happen. Ahhh.... what a lovely valentine's day blog!! 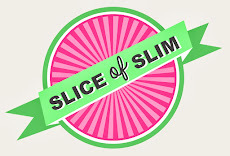 I "heart" Slice of Slim !!! We loved all your Valentine's Day suggestions because we are a couple of old romantics. You are sooooooo creative. I love it. Too late to make for today however. My 'true love' bought me a dozen red roses. First time in almost fifty two years. I smelt a rat as there were only eleven. Mr. Make Do and Mend had doctored an after shave bottle and had modified it to a vase in order to take a single flower. Obviously to get one red rose he had to buy twelve!!!! As you know him well you might appreciate this!. Anyway love these blogs of yours and just about to make the bloggynaisse - we have heating/water back on too! Thank you Janey. Inspirational yet again, putting things into perspective. Well Done.